FOR MORE THAN A DECADE the deserts have spread over once-produc­tive African lands. 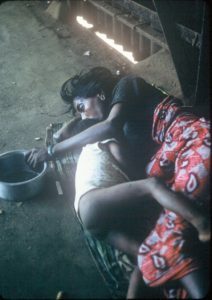 Now African famines are the harvests being reaped. In our Latin American back yard inflation soars, insurrections take innocent lives, governments tumble and communist regimes spring up or become more likely. Our answer? Politically, the out-of-power party blames the in-power party for not implementing a long-range plan to combat such tragedies and evils. What I propose is a program for which both parties can take credit – the Democrats for initiating it and the Republicans for expanding it. Ronald Reagan, the Great Communicator of this decade, could assure his place on the list of great presidents by a simple bold but peaceful move. In 1966 America spent $114 million to send 15,556 Peace Corps volunteers into service, the most dollars ever committed to volunteers. At the time, Sen. Jacob Javits proposed a Peace Army of a million young men. Labor leaders advocated a service corps of 100,000. The Peace Corps first deputy director, Warren Wiggins, called for a corps of 30,000 to 100,000. In 1984 America spent approximately $108.5 million and sent approximately 5,200 volunteers into service. What happened? Had the world’s plight improved so much that we could cut the Peace Corps by two-thirds? Were the hearts and minds of enough Third World people swayed to see the economic and social benefits of the democratic way? Had communist-inspired tur­moil and revolt diminished? Did we find a better way to let the world know who we Americans were than by exporting our skills, courage and heart through the Peace Corps? From 1965 to 1974, we assigned 2,582,304 soldiers with a budget of $138.1 billion to defoliate, mutilate and whore over the countryside of Vietnam. The cost for these services was $53,480 per soldier. In that same period we sent 108,579 Peace Corps volunteers with a budget of $956 million to teach, build and inspire over the world. The cost was $8,809 per volunteer. If America had used the Southeast Asian war budget to send volunteers into the world, America could have sent more than 15 million people out to plant crops, ideas and ideals. Which choice do you think would have most benefited our long-term national security de­sires? Our economy? 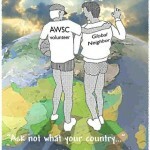 The global village’s needs? Challenging communist economic ideas with practical programs. Helping Africa reclaim its desert and grow food. Pitting the character of the working volunteer against the slogans of radicals and terrorists attempting to antagonize the masses. Establishing the economic and education­al infrastructure of developing countries. the only leader that could do this today. He was right. It happened. But the crop comes from small gardens. We should be tilling fields upon fields. The time is late. We need to lay more seeds. Dwayne Hunn of Mill Valley sewed in the Peace Corps in India from 1966-68 and speaks to groups about the importance of the Peace Corps.